I had the good fortune to know Mr. Wilde over more than five years starting at the end of May, 1960, until his death in September, 1965. During this time, Mr. Wilde had a tremendous influence on me and on the course of my life–he treated me as a son. Shortly after arriving in Neuchâtel, I started driving for Mr. Wilde. Mr. Wilde loved chaperoning students on trips, some outside of Neuchâtel. These proved to be educational not just for the students, but also for myself as the driver. The favourite destination was nearby France. France was going through tumultuous times with the war in Algeria and de Gaulle as President. Negotiations to end the war were going on in Évian, which can be seen from Lausanne. However, the main trip destinations were in the bordering Jura area and in Burgundy a bit further away. One year, the trip over the Pentecost weekend was to Saintes-Maries-de-la-Mer to see the annual gathering of the Gypsies. On almost every one of these trips, Mr. Wilde already knew the places and the people we met. A highlight of each trip aside from the cultural experience would be a good meal. The best of these was in the 2-star Côte-d’Or in Saulieu. I had my first “grand vin”, a 1955 Aloxe-Corton costing 10 Fr, the same price as the filet steak. The restaurant is now called Le Relais Bernard Loiseau and has 3 stars. There are two trips I remember well. In June 1962, we decided to try and see de Gaulle in Pontarlier when he visited the bordering area. After many road controls set up by a guard of CRS and Army totaling over 50,000, we succeeded in seeing him. On the other trip, which reflected Mr. Wilde’s strong Catholicism and my fading Catholic faith, Mr. Wilde took us to attend mass in a small church in the Jura. The reason for attending mass was to hear a sermon delivered by a gifted priest in an almost heavenly French. At the time, I had very good French and for me this was an extraordinary event. By the time I started working with Mr. Wilde booking and conducting trips, he had created a comprehensive multi-country travel program to give students an understanding of the people and cultures of many parts of Europe and Morocco. Although total travel time did not equal time in the classroom, 14 weeks of travel demonstrated Mr. Wilde’s firm belief that the year in Europe should go well beyond completing their Grade 13 degree. Mr. Wilde had also found excellent guides in many of the most important stops on the trips who brought to life the history of the places visited. There were four trips, including the one coming from Montreal which arrived in Liverpool. Mr. Wilde used the boat time and the travel time on land to Neuchâtel to get to know all the students. The first cultural adventure was Oxford, staying at a college, which had space for 100 students and kept costs down. A major challenge in organizing all the trips was to find room for 80 students at Christmas (20 would go to Austria to ski), and 100 both at Easter and on the trip through Europe to go back to Canada. This was before international tourism took off in the 70s when more hotels were built. The Christmas trip to Spain and Morocco was the most challenging: close to 3,000km to Marrakech via San Sebastián, a third of this crossing through a very somber France in winter, where seeing any sun was exceptional. The Easter trip was less challenging in terms of travel, and a major destination was Rome, where Mr. Wilde had been able to get rooms at the Hotel Columbus on Via della Conciliazione, less than 300m from St Peter’s. The origin of the hotel goes back to the 16th century and is a favourite of cardinals for consistories or other major Vatican events. Through contacts in Switzerland, Mr. Wilde was able to arrange audiences with the Pope and visits to the Vatican Gardens, at that time not open to the public. Seeing a particular site in Rome with Mr. Wilde could be an unusual educational experience. I remember a particular excursion to St. Paul’s outside the Walls where he told us that St. Paul’s was the only church in Italy where you could hear decent music. The reason for this was the large number of converted Anglican priests associated with the church. Those of you who have returned recently to many of the places they had seen in the early 60s were probably shocked at how many artifacts had disappeared from ancient Roman sites. Many had been moved to museums (or been stolen). The Neuchâtel students were fortunate to see them in situ before the huge increase in tourism that came in the 70s. The summer trip went east from Switzerland to Bavaria and Austria (Budapest was added later). From Munich, the next stop was always the Eisenhut at Rothenburg ob der Tauber on the Romantische Strasse. Here lived one of the most elegant hotels in Europe with an exceptional restaurant. To reach London by ferry, the next stops were Heidelberg and then Paris, or the trip moved north through Germany to get to Amsterdam. In either Paris or Amsterdam, there was enough time to get to know the city, and the hotels in each city were very centrally located to make it easy to get around. In London, students stayed several days at a university college near the centre which helped to keep the cost of the trip down. One of Mr. Wilde’s major objectives was to keep the trip costs down, with the occasional splurges like the Eisenhut and a few other top end hotels. While the trips Mr. Wilde designed and implemented offered vast opportunities to know the local culture and people, the smooth functioning of the trips was only possible because of the intelligence and cooperation of the students. They were particularly tolerant when faced with long days on the bus and the occasional late arrival. One year one of the buses burned its motor arriving in Casablanca. By miracle, the Wittwer driver (a certified mechanic as required by Swiss law) found new pistons and spent the night installing them and gave us a working bus the next morning (his tip at the end of the trip was well above the normal). Stopping at Lake Balaton, returning from the school’s first foray into Hungary, one of the ladies broke her leg jumping from a raft into the shallow lake. The hotel performed a miracle getting her to a hospital to have the leg set and ready to go the next day. Driving Mr. Wilde, I got to know him well. When I first met him, I was surprised at how welcoming he was. He offered me what turned out to be a rewarding five years: during these years, I drove for him but more importantly, he involved me in the planning, organizing and conducting of the school trips. Through him, I got a first part time job teaching English at the École Supérieure de Commerce. With this experience, I easily found other teaching jobs at private schools, e.g. La Chatelainie. With teaching income and income from work on the trips, I was able to manage my studies at the Université de Neuchâtel. As many others have said, Mr. Wilde was a generous and considerate person. He also had a temper which he could contain, but it showed on his face. I knew he was different when, the night before my Trigonometry exam, he invited me to go to Berne with him and others to see Fellini’s Dolce Vita knowing I had an exam the next day. He obviously agreed with what had always been my practice of not studying the subject the night before the exam. If you did not know it the night before, studying will confuse you. Mr. Wilde liked good food and had no trouble with the 50km drives to the Schweizerhof in Berne to eat well, especially game in the fall. He liked fresh food. We drove some 20km to buy fresh unpasteurized cream at Ins in the canton of Berne. Mr. Wilde dressed well, like many Englishmen who had the means. When he was in London, he would renew his stock of shoes at Church’s Shoe Store. He bought his clothes at PKZ in Neuchâtel. Mr. Wilde had an excellent collection of oriental rugs purchased from both from Swiss auctions and Erwin Gans-Ruedin’s store in Neuchâtel. Mr. Gans-Ruedin was a well-known expert in oriental rugs with many publications on them. Mr. Wilde had family including a sister who had married a Belgian. He had cousins in South Africa (Port Elizabeth and Cape Town) who had left England after the War. He decided to visit them and I had the good luck to be invited along as driver. 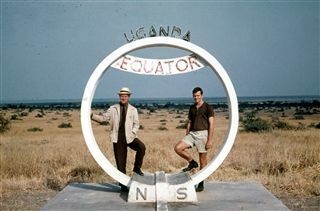 In addition to South Africa, he added Kenya and Uganda on to the trip. We saw the White Nile and a lot of animals at Murchison and Queen Elizabeth Parks. This was before Idi Amin who used the game to feed his troops. And there was hardly a tourist in sight. One summer when we were in the UK, Mr. Wilde went to visit his family home north of Manchester. He decided to go further north to visit Miss Grace MacNaughton who summered north of Loch Lomond. I saw this as a very considerate gesture. Miss MacNaughton had an interesting history. Before coming to teach English at Neuchâtel, and before being Principal of Bishop Strachan School, she had taught in India. She left India with malaria and she had to deal with it all her life. Mr. Wilde also showed great consideration with another teacher from Neuchâtel, Mr. James West, who became ill with cancer. Mr. Wilde and I visited him often at his hospital in Berne (for me the high quality of the room and treatment was an eye opener). After operations to remove cancer in various organs, Mr. West, although weakened, was able to travel to Rome to spend time at the ruins, which along with Latin, had been his major life companions. He returned to Berne weakened but happy, and died shortly after. When I left Neuchâtel in the summer of 1965, I was hired by the Royal Commission on Bilingualism and Biculturalism to do a study on language rights in Switzerland—this involved a six-week trip to Switzerland for research and interviews. On September 25th, I was in Berne and had arranged to see Mr. Wilde when he was at Grindelwald with the Neuchâtel students. Leaving Interlaken on the way to Grindelwald, I came across what none of us ever wants to see: Mr. Wilde’s Volvo was on the left side of the road in front of a small bus with which it had obviously collided. The police told me that the driver and his passenger had been taken to a small hospital a few hundred meters down the road. At the hospital, I learned that Mr. Wilde had died instantly and that the student with him would not survive. The driver of the bus was being treated for a broken leg. I drove on to Grindelwald to deliver the horrible news. I returned to Neuchâtel a few days later for the funeral. This was the worst way possible to take leave of a man who was fully devoted to my well-being and future. I think we had been friends. One deep memory he left me which reflected his ability to know people, was when in January 1964, after I had fallen for a young woman at Neuchâtel who had also fallen for me, he told me: Peter, she is right for you. And he was right. We are still together. About the author: I was not a student at Neuchâtel, but over five years as his driver and assisting in planning and managing trips, I got to know Mr. Wilde better than most. After graduating from the University of Neuchâtel, I worked for a year with the Royal Commission on Bilingualism and Biculturalism, followed by the OECD in Paris and from the early 80s on in Ottawa—first with the Department of Finance and then the Canadian International Trade Tribunal. My wife Judy A’Court (63/64) and I have two children and two grandchildren. Since we retired to Mexico at the beginning of 2005, our two favourite pursuits have been golf and especially travel to many different parts of the world, often routing trips through Canada to visit our family and friends.